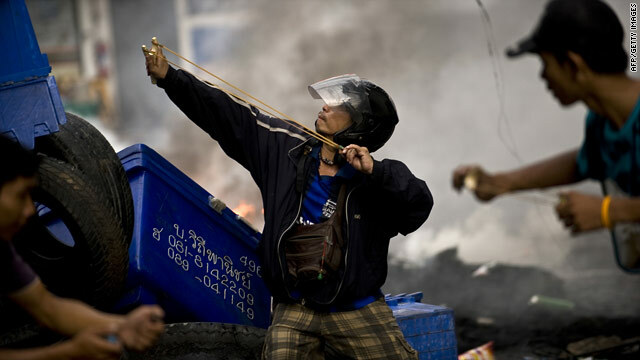 Thai demonstrators use slingshots to launch stones against security forces during clashes in Bangkok on May 16, 2010. (CNN) -- Days of violent unrest in the Thai capital have left dozens dead and hundreds injured as security forces clash with anti-government protesters. The latest victims include a key opposition leader, Maj. Gen. Khattiya Sawasdipol -- a renegade general better known as Seh Daeng -- who died days after being critically wounded by a sniper's bullet. But the current crisis follows a months-long standoff between Thai authorities and protesters opposed to the government of Prime Minister Abhisit Vejjajiva. The protesters -- known as the United Front for Democracy Against Dictatorship (UDD) -- support Thaksin Shinawatra, who was prime minister from 2001 to 2006, before he was ousted in a bloodless coup. The latest violence follows a government pledge to hold an election in November in an attempt to halt the protests. However, amid ongoing anger over a crackdown by security forces last month and a refusal by the protesters to comply with a deadline to vacate the district of Bangkok they have been occupying for weeks, authorities say the election date is now under threat. Three days later, the deadliest clash in more than a decade between protesters (in this case the Red Shirts) and the military erupted, leading to the deaths of more than two dozen demonstrators and military forces. Violence erupted again last week when protesters once again ignored an ultimatum to end their occupation in downtown Bangkok by Wednesday. Seh Daeng's subsequent shooting by an unknown assailant raised tensions further and at least 35 people have been killed and 240 wounded in the latest wave of unrest. The government has imposed a state of emergency in 22 provinces and metropolitan Bangkok. Authorities have urged protesters to evacuate the protest area by Monday afternoon or face up to two years in prison for violating the order. But around 5,000 protesters remained on the streets in defiance of the authorities. On Sunday protest leaders offered to resume talks with the government in U.N.-mediated negotiations if security forces were withdrawn from the streets. But the government has not accepted the offer. A senior official told CNN that authorities were under pressure to be more decisive in taking action to end the protests and claimed the government had been showing patience and restraint. Media and analysts in Thailand say civil war may be looming, between the Red Shirts and the so-called "multi-colored shirts" (who support Abhisit). They are displeased with the disruption caused by the protests. They are generally middle-class city dwellers. They are not pro- or anti-government, they simply want the government to shut down the Reds to end the violence and interruptions to daily life. The red and multi-colored shirts have clashed in Silom Road, Bangkok's business and financial district. How will Seh Daeng's death affect the protest movement? CNN's Sara Sidner said it was unclear what the immediate impact of Seh Daeng's death would be. "Not all the protesters followed him as some thought he was too much of a hardliner," Sidner said. Some protesters argue that the Red Shirt movement should negotiate with the government to reach a settlement. But militant armed factions loyal to Seh Daeng and known as "Black Shirts" reject negotiation and appear ready to use violence to achieve their goals. It's an easy way for them to create an identity. It all started with the Yellow Shirts wearing a color associated with Monday, the day of the week that Thailand's revered king was born on. That was designed to show their allegiance to the king, and more broadly the traditional elite which has dominated Thai politics for years. Thaksin's supporters then picked a color to distinguish themselves from the Yellow Shirts. As a businessman, Thaksin made billions of dollars from his communications company Shin Corporation. In 2008 he was found guilty and sentenced in absentia to two years in prison for a land deal that enabled his wife to buy a valuable city plot for a fraction of its true value and he faces other corruption charges. More than $2 billion in Thaksin's family assets are currently frozen in Thailand but there is speculation he has a great deal more money elsewhere. Many western embassies have shut their doors and are warning their citizens against travel to Bangkok as violence in the city continues. "Due to escalating violence in central Bangkok, including gunfire near the U.S. Embassy, demonstrations in Chiang Mai, and other incidents throughout Thailand, U.S. citizens should defer all travel to Bangkok and defer all non-essential travel to the rest of Thailand," the U.S. State Department has warned. As well as advising against travel to Bangkok, the UK Foreign Office warned of protests and violent incidents in popular tourist destinations such as Pattaya, Chiang Mai, Chiang Rai and Ayutthaya. But Bangkok's main Suvarnabhumi airport is operating as normal it said.